How could a fabric that originated in India, was copied by Armenians, and outlawed in France become a symbol of Provence? 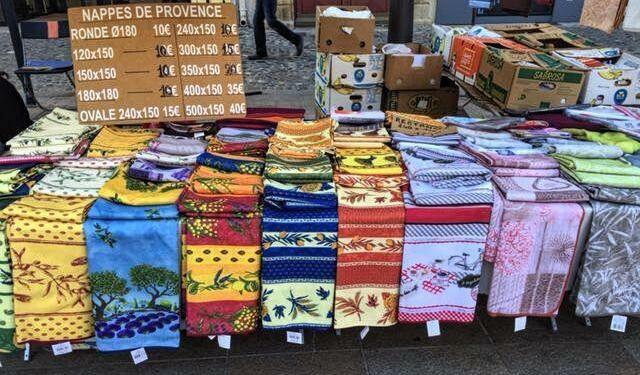 The kaleidoscope of cotton fabrics that punctuate the Provençal markets today, just seem to shout “southern France.” They are decorated with cicadas, olives, and flowers in colors that reflect the local landscape: sky blue, sunflower yellow, lavender purple, olive green, and reds reminiscent of the hills of Roussillon. What could be more Provençal?… Or Indian? …Continue reading here as Margo unveils the background behind the printed fabrics in Provence. You are a certain to find in these festive napkins, tablecloths, t-towels in the markets (and boutiques) of Provence. Discover why these bright cotton prints, which are readily available in large quantities, were at one time just for the nobility.